Painting from the Inside Out points the artist in the direction of their true leverage, which is their ability to think and feel their way to a satisfying and successful painting. 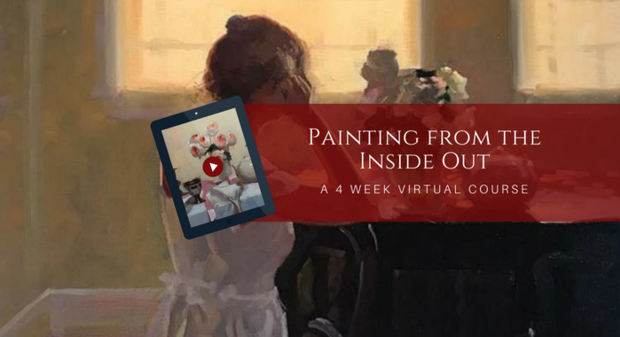 In this course, Dennis teaches the painter how to create a personal vision for their work and to achieve that vision, not just through the physical materials but also by tapping into their unlimited potential. Through high quality live & recorded video and in the moment narration, Perrin will share live demonstrations direct from his studio. This course will allow you, the artist, to discover the true source of your creative genius by taking your focus off individual paintings and placing it on to you, the creator of the paintings. Paintings flow from you, so working on you produces a higher order of satisfaction and success. Painting with a “quiet” mind allows the artist to truly see into the subject and then translate that vision into paint. The quiet mind sees only abstract shapes of value and color that are not sullied or influenced by pre-assigned names or categories. Names of “things” and “colors” result in uni-dimensional, “stick-figure” shorthand versions, and obscure the ability to discern the actual relationships present in the subject. The quiet mind is obtained through the combination of meditation and intentional practice. Meditation allows one to feel what the quiet mind feels like. This can then carryover to the practice of quieting the mind during the painting process. Eventually, mastery over the mind’s activities (or lack of activity) will give the artist the freedom to listen to external music or talk without distraction, and to eventually be able to talk themselves while painting, since painting becomes an intuitive, non-linguistic activity and is not disturbed by conversation. 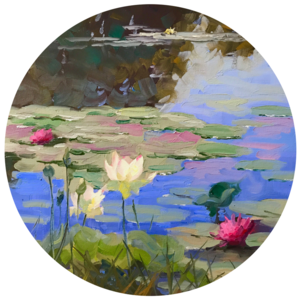 Putting intention into your work all the way from the first thoughts until the final brushstroke is a powerful step toward successful and satisfying painting. Also, putting an intention into every application of paint during the physical painting process. Meditating daily helps in finding that “sweet spot” where the idea of expressing yourself in paint feels really good. This is a progressive, practiced internal activity that allows the practitioner to move from an emotionally desensitized state to one of heightened sensitivity to emotions. So often the painter is consumed with “details” of a subject, the “specifics.” This is tantamount to looking at the side of the road while driving 70 mph, where the feeling is hectic and out of control, as opposed to staying focused on the horizon and the road ahead, where the feeling is slow and easy. Stay focused on the “road ahead” (the big, general, simple shapes) and everything about your process will feel relaxed and easy. The creative process has a very defined shape, always moving from general toward specific. Everything is created this way, and a painting is no exception. That’s why the focus has to be on the large, simple, foundational, underlying shapes. The details will then fit logically into this structure, which is composed primarily of value relationships that are also influenced by color and temperature. The focus of Painting from the Inside Out is on YOU, the artist. 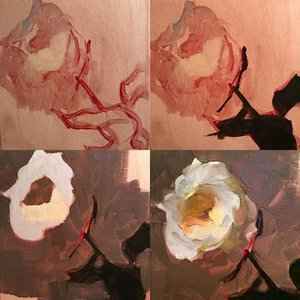 "There is no doubt that learning the Perrin Method has improved my painting skills . 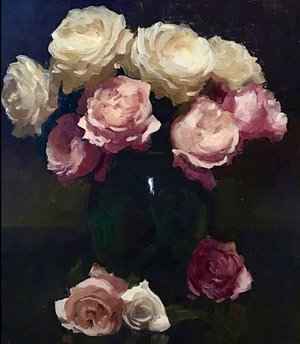 The calm manner of presentation, visualization and reflective thoughts of our instructor have led me to a higher level on the 'reason' why I want to paint and gives me determined purpose to continue to learn and to grow. I have enjoyed this plein air experience immensely. I felt like I was right there with you at the pond and watching Aimee chase squirrels at the park. Besides the technical aspects of the course, it was the genuine camaraderie that uplifted my spirits and gave me that eagerness to learn more and put it into action. I was not able to get outdoors as much as I would have liked but there are days and months ahead with plein air from my window. Blessings to all of you.” - D.H.
"Dennis, This course (and the other one I took) have been amazing. I've learned so much, changed so much, love the water soluble oils, changed my whole studio set up, the way I think about painting, etc. Can't thank you enough and everyone who participates as well. So much gratitude." - K.L.